Law-Decrees 101 and 102 of the Republic of Cuba provide retirement, disability, and survivor pensions for the personnel of the Ministry of the Armed Forces (MINFAR) and the Ministry of Interior (MININT) of the Republic of Cuba. These two laws effective February 24, 1988 provide better pension benefits than those provided under Law 24 on So cial Security that provides pension coverage for almost every other Cuban worker. The generous benefit provisions under Laws 101 and 102 combined with the size of the work force in the two Ministries (estimated at between 5% and 10% of the Cuban labor force) produce significant financial obligations that would have to be addressed during a Cuban transition to a market economy. This paper describes the benefit provisions under both laws, pointing out the differences in the treatment of the MINFAR and the MININT employees. It also points out the differences between the pension promises for the members of this select group, and those for the great majority of the Cuban labor force. Estimates of the costs of these programs are calculated using an individual actuarial model that reflects Cuban mortality and various possible economic scenarios. Finally the paper contains a brief outline of cost reducing alternatives to the current pension schemes for the personnel of these two Ministries during and beyond the Cuban transition to a market economy. For example, a member of the FAR could retire at age 45 after 25 years of service and receive a monthly pension equal to 50% of his final pensionable pay for the rest of his life. A jet pilot would be eligible to receive a similar pension while in his mid-thirties after only 12.5 years of active service, as would be the case for a seagoing sailor after 16.67 years of service. The top commanders of the FAR, Fidel Castro Ruz and Raúl Castro Ruz, whose service dates back to the Moncada assault, have accrued to this date 126 years of pensionable service (July 26, 1953 to July 26, 1995 times a factor of 3) but their pensions are capped at 90% of their final pensionable pay ($450 per month 10) or $405 per month. Those collecting seniority pensions are entitled to receive their pensions with no reduction while employed in the civilian sector after retirement from active military service. The only exception applies to those who have completed higher or professional education, and who are working in a position similar to the one they held while in active military duty. 11 The pension for this type of retiree is reduced by the amount that the sum of their Law 101 pension and their civilian salary exceeds their last military salary. This and other features of Law 101 can be waived or ignored by a decision of the Minister of the FAR 12 who can also assign special pensions to those whom he deems deserving. The amount of a total and permanent disability pension ranges from 75% to 90% of final pensionable pay if the disability is directly related to military activities and from 60% to 75% of final pensionable pay if the disability is not directly related to military activities. 14 Partial and permanent disability pensions range from 40% to 50% of pay for military related disabilities and from 30% and 40% of pay for nonmilitary related disabilities. Disability coverage is normally extended to the three months after leaving military service but it is extended indefinitely for those whose disability is directly related to injuries or illnesses suffered while in active military service or during the insurrection against the Batista regime. Law-Decree 102 of Social Security for the Ministry of Interior (Law 102) was also signed by President Fidel Castro Ruz on February 24, 1988. Its stated purpose is to improve the living conditions of the Ministry of Interior personnel whose Social Security coverage is deemed insufficient due to the nature of their jobs. Law 102 provides pension benefits for the “combatants” of the MININT and their dependents in the event of retirement, disability, or death. 20 Law 102 is very similar to Law 101 except for some key provisions that are noted in this section. Pension payments under Law 102 are made from the same source used for paying the pensions under Law 101: the Social Security budget. Law 102 does not address the issue of the type or level of contributions required to finance the pension accruals during the active service period of the MININT personnel. The Minister of Interior also has the power to provide additional pensions, to increase pensionable service, or to establish special payment conditions without regard to other provisions of Law 102. The benefits provided under Laws 101 and 102 are more generous than those provided under Law 24 of Social Security (Law 24). This more generous treatment extends to each of Law 24’s monetary benefits: retirement pensions, permanent disability pensions, and survivors’ pensions. The most significant improvements over the provisions of Law 24 are discussed below. Pensions are calculated under Laws 101 and 102 based on final monthly salary, while under Law 24 they are calculated using the average pay of the highest five (5) years of the last ten (10) years preceding the pensionable event: retirement, disability, or death. This difference in defining the pensionable pay is not important in a constant salary environment (one in which the salary stays constant during the ten years preceding the pensionable event), but in a normal inflationary environment where salaries are expected to increase over time, having pensionable pay based on the last monthly salary provides a larger pension than when it is based on the average of the last five years. Because of this definition of pensionable salary, pensions under Laws 101 and 102 are greater than equivalent pensions under Law 24 by a factor, roughly equal to twice the salary increase rate of the averaging period. For example, Law 101/102 pensions would be 6% greater than Law 24 pensions if one assumes a modest salary increase rate of 3%, and 49% greater if one assumes a high salary increase rate of 25%. Law 24 sets a normal retirement age of 60 for men and 55 for women after 25 years of normal employment conditions, defined as conditions that do not lead to premature aging or deteriorating health. This is in contrast to Law 101 which does not set a normal retirement age but rather a service requirement of 25 years and Law 102 which sets a normal retirement age of 45 after 25 years of service. Because of these retirement conditions those retiring under Laws 101/ 102 are expected to receive pension payments during a longer period than those retiring under Law 24. The total value of these additional payments can be determined as the increase in the annuity value of the pension due to the earlier commencement age. The magnitude of this additional annuity value depends on the interest rate used to discount the future pension payments. For illustrative interest rates of 0%, 6%, and 9%, the annuity value of the Laws 101/102 pensions is increased by 66%, 28%, and 20% respectively due to pensions being paid starting at age 45 rather than at age 60. Laws 101/102 allow for the collection of a full pension after retirement as long as the pensioner has not received higher education and is not employed in the same kind of job performed while in active service. If both these conditions are met, the pension is reduced by the amount that the sum of the pension and the current salary exceeds the last monthly salary while on active service with the FAR or MININT. Law 24 applies the same pension reduction formula to all retirees. The author does not have access to any documentary evidence on the application of this provision of Laws 101/102. Nevertheless, anecdotal information suggests that FAR and MININT pensioners who are retired around age 45, and who join a civilian enterprise after retirement, are collecting both their full pensions and their full civilian salaries. In a market economy this practice would lead employers to hire military pensioners over equivalently qualified civilian personnel because they have lower salary requirements. In a highly politicized non-market economy with limited desirable employment options such as Cuba today, this policy leads to the exclusion of civilian personnel from many desirable employment positions because of the established relationships among former FAR and MININT personnel, and the classification of large sectors of the Cuban civilian economy as national security sectors. To accurately establish the costs and liabilities of the pension promises under Laws 101/102 one would need far greater data than what is readily available from published sources about the FAR and the MININT. This section details an estimate of the costs and liabilities for Laws 101/102 first from an individual participant perspective and then in aggregate for the entire FAR and MININT. This section is divided into two parts: the first briefly describes the assumptions and methods used in determining the costs and liabilities, while the second details the results of this estimation. Due to the lack of data on the demographic composition of the FAR and MININT personnel, costs and liabilities have been estimated assuming hypothetical participants under both an average salary method and an average pension method. Both methods result in ranges of possible costs, expressed in pesos and as percentage of salaries. The average pension method also provides a range of values for the pension liabilities. Average Salary Method: Under the average salary method, costs are determined as a percentage of salary for a hypothetical participant who joined either the MININT or MINFAR at age 20 and who will retire after 25 years of service at age 45. Costs are determined under two salary scenarios: Slow Track and Fast Track. The salary under the Slow Track Scenario is assumed to remain constant throughout the entire 25 year career, while under the Fast Track Scenario, the monthly salary increases annually from $120 at hire to $450 at retirement. The Slow Track Scenario reflects the career of a noncommissioned officer who is never promoted while the Fast Track Scenario simulates the career of a noncommissioned officer who rises to minister at retirement. The Slow Track Scenario results provide a lower limit on the costs of these programs while the Fast Track Scenario results provide the upper limit. Costs under the average salary method are determined by first calculating a pension cost as percentage of salary by dividing the present value at age 20 of a pension equal to 50% of final salary payable from age 45 by the present value of salaries from age 20 to age 45. These present values are determined using representative interest rates of 0%, 6%, and 9%. No actuarial decrements are assumed during the 25 years of active service but mortality derived from a Cuban life expectancy table 29 is assumed in the postretirement period. The total cost of the program is then calculated by multiplying this percentage of salary by a total payroll that assumes 180,000 active participants with an average salary of $250 per month. This total cost does not reflect the accumulated cost for past pension liabilities. Average Pension Method: Under the average pension method, the present value of future pensions is determined assuming an average monthly pension of $126 per participant. This present value is calculated assuming six different service scenarios: 25, 20, 15, 10, 5, and zero years to retirement at age 45, and three different interest rates scenarios: 0%, 6%, and 9%. As under the average salary method, no actuarial decrements are assumed while in active service and Cuban mortality is assumed after retirement at age 45. Similarly the estimates are based on the assumption of 180,000 active participants with an average salary of $250 per month. Costs under the average pension method are determined as the sum of two components: a Normal Cost, and an Amortization Cost. The Normal Cost is determined by dividing the present value of future pensions by the total years of pensionable service (25). The Amortization Cost is determined by amortizing over the number of years to retirement the Accrued Pension Liability. The Accrued Pension Liability is determined by multiplying the Normal Cost by the number of years of past service. Costs under this method are also expressed as a percentage of total salary by dividing the sum of the Normal Cost and the Amortization Cost by the total payroll. 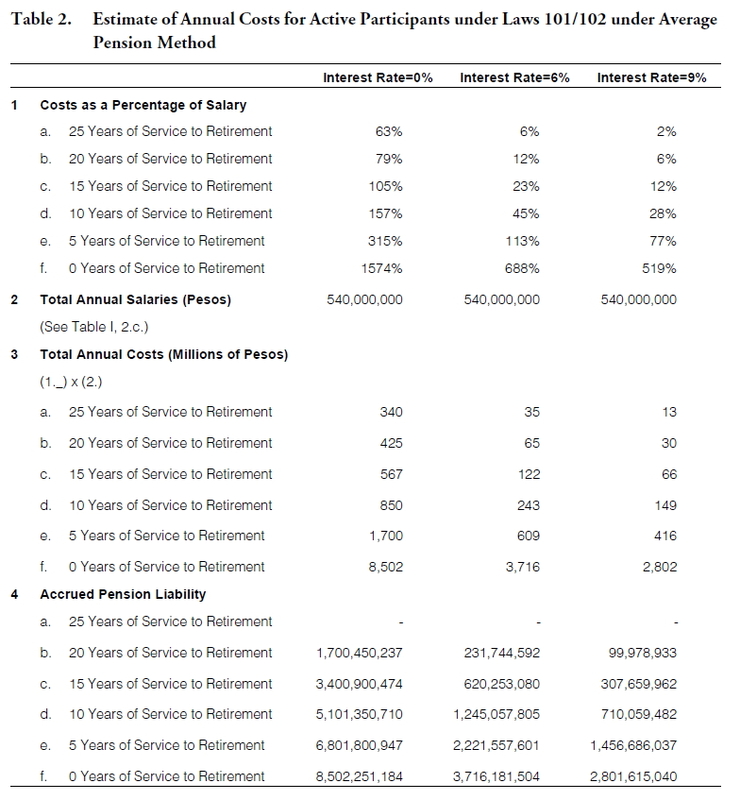 Tables 1 and 2 detail the results of applying the pension cost methodology described above. It should be emphasized that these cost estimates are very rough and that a more accurate estimate of the pension costs and liabilities would require far more detailed demographic information. Still, the above described methods allow for the establishment of a range of possible accrual costs for Laws 101/102 pensions. The average salary method produces current service accrual costs that range from 637 million pesos to 32 million pesos. The most realistic interest scenario of 6% narrows this range to between 140 million pesos and 65 million pesos with a median accrual cost of 103 million pesos. This accrual cost does not reflect the additional cost of recognizing any accrued pension liabilities for past service to date. The average pension method results in a wider range of accrual costs, principally because it includes the additional cost of amortizing the past service liabilities over the remaining years to retirement. The current service accrual costs under this scenario range from 13 million pesos to 8.5 billion pesos. It should be noted that among these scenarios the more realistic ones are those assuming 10 or 15 years to retirement and an interest rate of 6%. The accrual cost for these two scenarios range from 122 million pesos to 243 million pesos with a median accrual cost of 183 million pesos. It is interesting to note that the results for the 20 years to retirement scenario under the average pension method are similar to those for the Slow Track Salary scenario under the average salary method. There is a similar correlation between the 15 years to retirement scenario under the average pension method and the Fast Track Salary scenario under the average salary method. Both methods ignore the current cost of Laws 101/ 102 for pensions in payment. Monthly retirement pensions could range from the minimum monthly pension of $126 to 90% of the maximum pensionable salary or approximately $405 if one takes the official Minister’s salary as the maximum monthly salary. The number of pensioners under both Laws 101/ 102 could be estimated as 20% of the number of active participants or 36,000. This would lead to total annual pension payments of between 54 million pesos and 175 million pesos with a median of 115 million pesos. Putting together the median estimates for both actives’ accrual costs and pensions in payment, the total annual costs for Laws 101/102 could be estimated to fall between 218 million pesos and 298 million pesos. The low end does not include the accrual costs for any past service liabilities. From the previous section it is clear that there are significant financial issues that must be faced during the transition to a market economy because of size of the pension liabilities created by Laws 101/102. The beneficiaries of these pension promises are probably the individuals most responsible for placing Cuba in its current economic distress, not to mention its political situation, but unless one could bring about a complete liquidation of existing legislation, institutions, and relevant individuals, the transition team would be faced with the challenge of reducing the MINFAR and MININT ranks in a gradual and orderly manner. Laws 101/102 could provide a mechanism to cashier many if not all of those who would be most antagonistic to a transition to a market economy. At the same time the generous benefits regime under Laws 101/102 cannot be continued without putting serious pressures on the finances of the new government or on the health of the transition economy. Whatever decision is reached regarding the ultimate fate of Laws 101/102, a complete actuarial study should be completed to determine the liabilities and future costs of their pension obligations. This study requires the identification of all those eligible for benefits under both laws including those in active service and those receiving pensions. For those receiving pensions an additional effort should be made to identify which portion of their pension was calculated according to the letter of the law and which portion is due to discretionary decisions by the relevant ministers or government officials. The actuarial study should calculate each participant’s accrued benefit and corresponding annuity value. The calculations for active participants can be used in the establishment of a compensation baseline for cashiering active MINFAR and MININT personnel. Annuity values for pensions in payment will be used to establish the funding requirements for the pensions in payment. If Laws 101/102 are kept as the bases for providing pensions for military and security personnel, they should be amended to improve administration and accountability. The first step should be to separate the funding and administration of these pensions from the administration and budget of other Social Security programs. Both laws should be amended to eliminate the Ministers’ discretionary powers to provide or improve benefits, and the service multipliers due to participation in historical events. They should also be amended to permit the payment of pensions to those leaving the country. Special effort should be made to revoke additional pensions granted in the past for reasons other than economic hardship. An alternate system to Laws 101/102 would be to provide benefits in line with those provided by a revamped Social Security system. This may involve the establishment of individual retirement accounts which are funded by participant contributions at the same level as the general Social Security system, and supplemented by additional government contributions for increases in salary or rank, or performance of meritorious services. This system will provide benefits which are similar to those of the general population and it is subject to the same annual budget discipline required to establish payroll budgets. It also has the advantage of vesting the participants in pension accruals at the time they earn them. It would be advisable also to establish a fund for paying the old pensions under Laws 101/102. At its inception, this fund could be built up from the proceeds of sale of military properties and surplus equipment. Any unfunded liability should be funded over the long-term from general revenues. It is beyond the scope of this paper to determine the specifics of establishing this fund. This paper provides a first estimate of the financial costs and liabilities under the special pension regime of the MINFAR and MININT personnel. 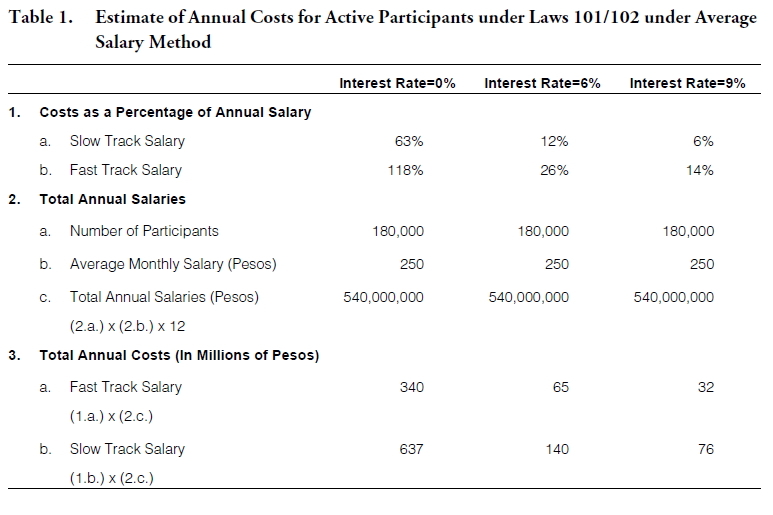 Although the lack of accurate and detailed demographic data hampers the estimation of these costs, this paper provides a basis to roughly estimate the annual cost of the Laws 101/102 at around 300 million pesos assuming 180,000 active participants and 36,000 retirees. Any transition to a market economy should include placing these pensions on a sound financial footing which would include recognizing any legitimate promises made to exiting pensioners but replace the current system with one that is more financially sound.